Compost tea has long proven to be a great form of fertilizer, but there’s more to it than N-P-K. Growing research points to other important benefits, such as improved disease resistance in plants, and the proliferation of healthy microorganisms in soil treated with compost tea. In the past, making compost tea has been a fairly scary enterpise – it’s not uncommon to brew a stinky tea that contains pathogens, particularly E.coli, that will actually do more harm than good. Now, manufacturers of the Soilsoup Compost Tea Maker have created a product that ensures batch after batch of perfect, powerful, benevolent compost tea. This product has the potential to revolutionize home gardening. 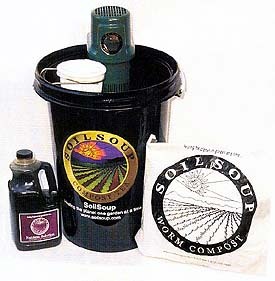 Soilsoup is like liquid compost. It can be watered into the soil, used as a foliar spray on lawns, or added to the compost bin to speed up the composting process. This summer I’ve been using the 6.5 gallon system kit, best for the hobby gardener, and so far haven’t been able to poke a single hole in the hoopla or hype. Check out this link to learn more: www.soilsoup.com.